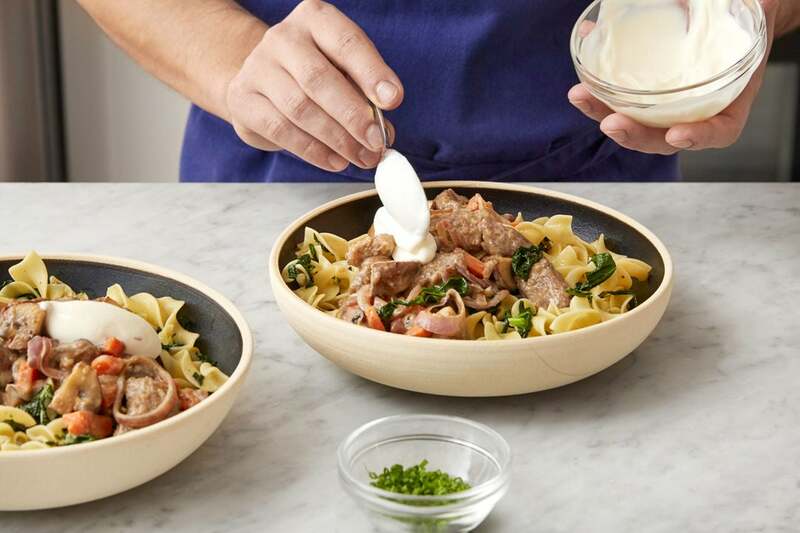 The comforting sauce for this classic dish gets its irresistible richness from sour cream, chicken broth, and two kinds of mushrooms: fresh cremini and dried shiitake. 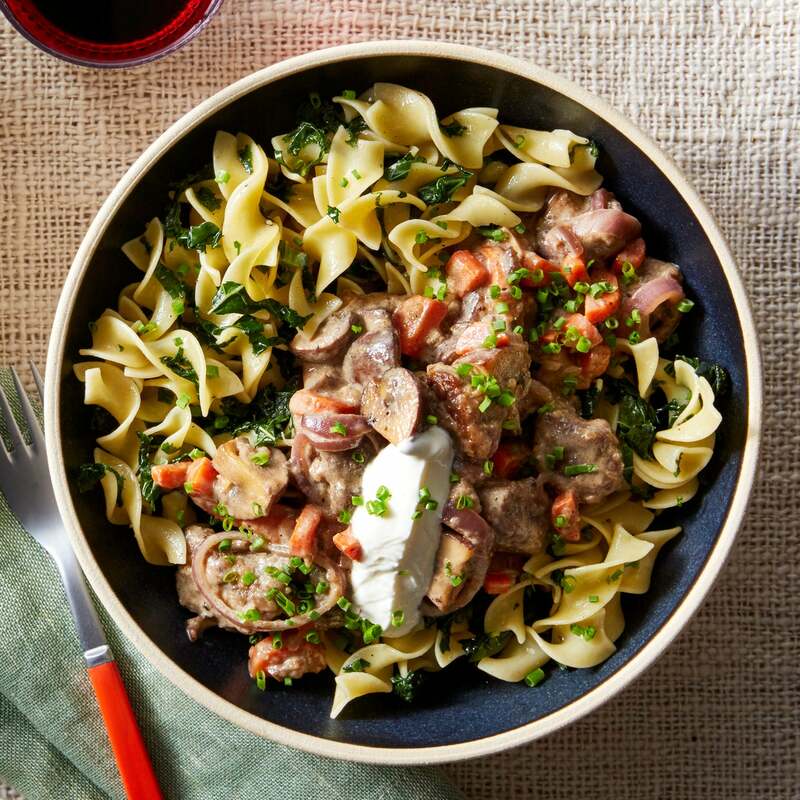 Studded with tender bites of beef, the sauce perfectly coats all the nooks of buttery egg noodles. Heat a large pot of salted water to boiling on high. Wash and dry the fresh produce. Remove and discard the stems of the kale; thinly slice the leaves. Quarter the cremini mushrooms. Peel the carrots; halve lengthwise, then thinly slice crosswise. Peel and thinly slice the shallot. Thinly slice the chives. In a bowl, combine the dried shiitake mushrooms and 1 cup of hot water. In a large pan, heat a drizzle of olive oil on medium-high until hot. Add the sliced kale; season with salt and pepper. Cook, stirring frequently, 2 to 3 minutes, or until slightly wilted. 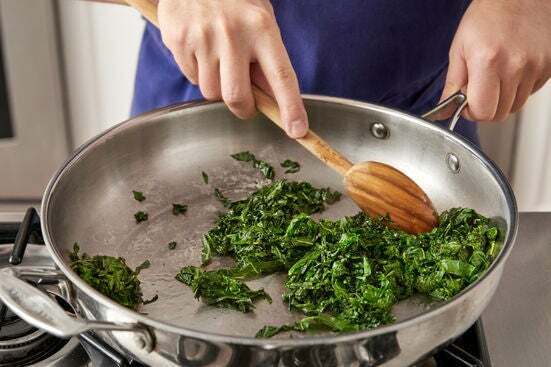 Add 1/4 cup of water and cook, stirring occasionally, 2 to 3 minutes, or until the kale is wilted and the water has cooked off. Transfer to a bowl. Cover with aluminum foil to keep warm. Wipe out the pan. Pat the beef dry with paper towels; season with salt and pepper. In the same pan, heat a thin layer of oil on medium-high. 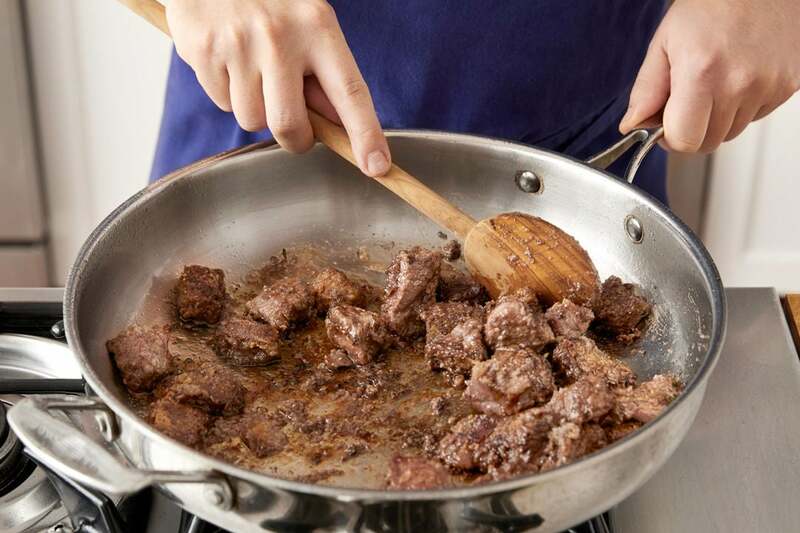 Once hot enough that a piece of beef sizzles immediately when added, add the seasoned beef in an even layer. Cook, without stirring, 2 to 3 minutes, or until lightly browned. Continue to cook, stirring occasionally, 2 to 3 minutes, or until browned. Leaving any browned bits (or fond) in the pan, transfer to a plate. 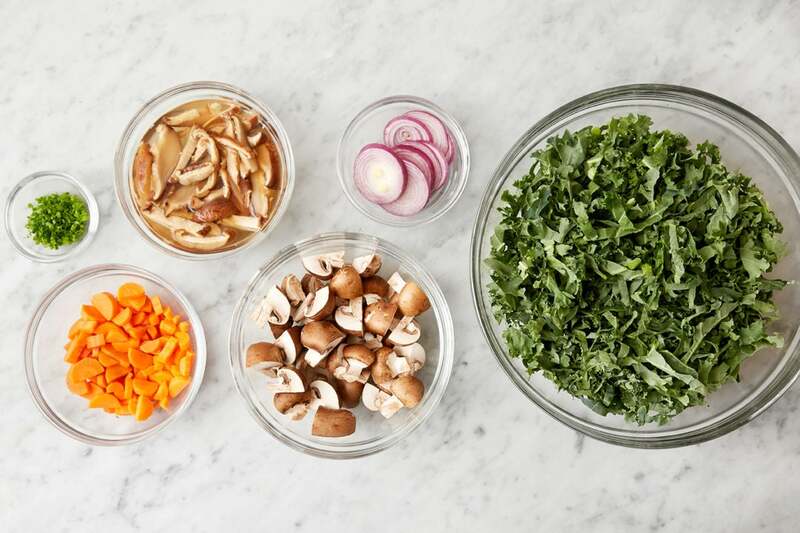 Reserving the water, transfer the rehydrated shiitake mushrooms to a cutting board and finely chop. Add 2 teaspoons of olive oil to the pan of reserved fond; heat on medium-high until hot. Add the quartered cremini mushrooms and sliced carrots. Cook, stirring occasionally, 2 to 3 minutes, or until lightly browned. Add the sliced shallot and chopped shiitake mushrooms; season with salt and pepper. Cook, stirring occasionally, 2 to 3 minutes, or until slightly softened. 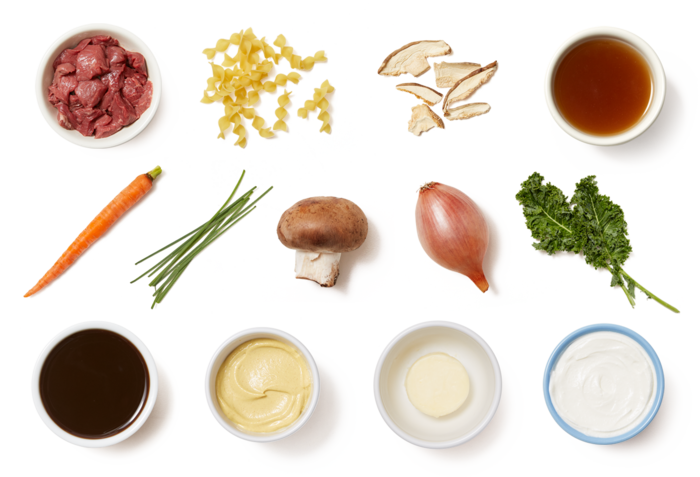 Add the broth and reserved mushroom water; cook, stirring frequently and scraping up any fond, 1 to 2 minutes, or until combined. 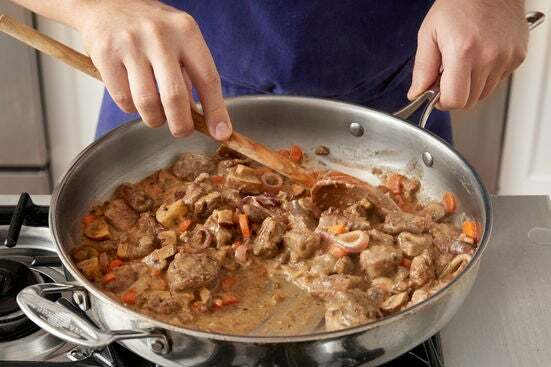 Add the browned beef and cook, stirring occasionally, 3 to 4 minutes, or until the liquid is thickened and the beef is cooked through. Turn off the heat; stir in the mustard, Worcestershire sauce, and half the sour cream. Season with salt and pepper to taste. 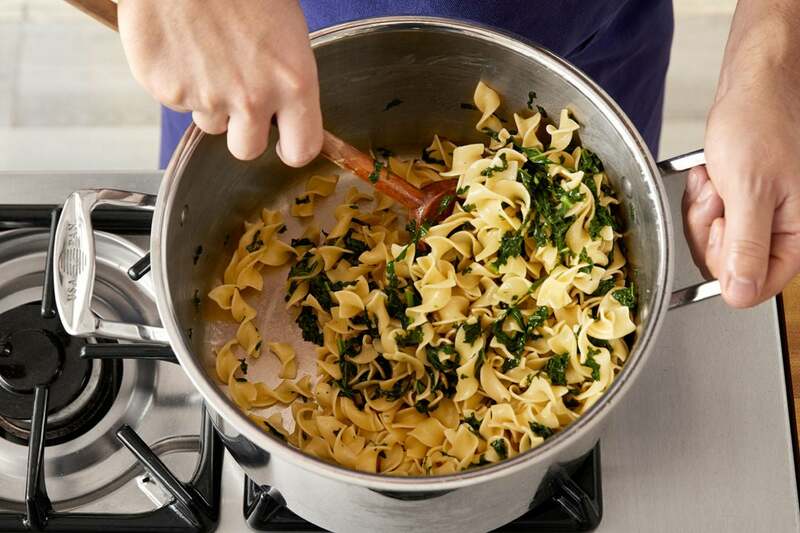 While the sauce cooks, add the noodles to the pot of boiling water. Cook, stirring occasionally, 6 to 8 minutes, or until al dente (still slightly firm to the bite). Turn off the heat. Drain thoroughly and return to the pot. Stir in the butter and cooked kale until the butter is melted and thoroughly combined. Season with salt and pepper to taste. Serve the finished noodles topped with the cooked beef and sauce. Garnish with the remaining sour cream and sliced chives. Enjoy!